What you see here is a beautiful sunset amidst peaceful, blue skies. What you don't see is the rest of the Colorado Plateau enshrouded in dark clouds and storm light. The sky was covered in clouds less than an hour before this shot, but as the sun began to set the storm also dispersed. 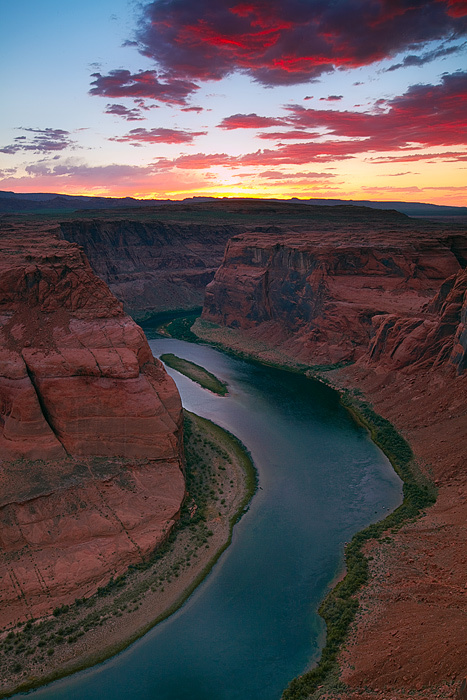 This was the result at Horseshoe Bend facing almost due west. I chose an abstract view of the Colorado River to best present the sky and its dramatic colors. Photo © copyright by Michael Greene.